Made famous in recent years by the series of animated children’s films, the island of Madagascar is renowned for its unique wildlife and ecosystems – home to life found nowhere else on Earth. 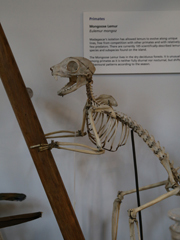 In the first in a new series of native fauna-focused displays, we present some fascinating Madagascan specimens from the Museum’s collections. Approximately 165 million years ago Madagascar was located in the middle of the supercontinent Gondwana, between the lands that eventually became South America and Africa and those that would become India, Australia and Antarctica. Through movements of the Earth’s crust, Madagascar eventually became marooned in the Indian Ocean and around 88 million years ago became the island we know today. Its habitats range from tropical and deciduous rainforests to spiny deserts and reefs. These ecosystems contain a vast array of wildlife; around 90 percent of all animal and plant species are endemic to the island. Among the best-known endemic species are lemurs, a primitive group of primates, and chameleons, a distinctive group of lizards. Madagascar’s isolation has allowed lemurs to evolve along unique lines, free from competition with other primates and with relatively few predators. There are currently 105 scientifically described lemur species and subspecies found on the island. The sunset moth is day-flying and uses its bright colouration to warn predators of its toxicity. Its caterpillars feed exclusively on the toxic plant Omphalea and it is the plant’s toxins that are stored throughout the moth’s development, even into the adult stage. The threats to these incredible species are great, ranging from deforestation and agricultural fires, to soil erosion and the introduction of non-native species. Scaly Ground Roller and Short-legged Ground Roller from Madagascar - these elusive birds nest in holes in the ground and have plumage which camouflages with the Malagasy forest habitats.